All of these operations can be done in the program. Here is how. In this dialog you can see all fields of the database as a list displaying name, type, size of each fields as well as their order. Note that you cannot change the contents of these fields here. You need to edit the DBF file instead to do this. 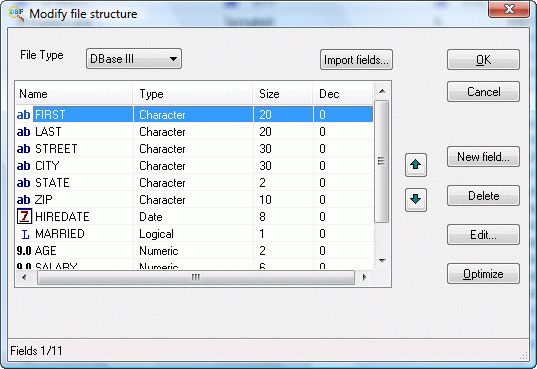 This dialog box only changes the structure of the DBF file. To edit a new field, click the New field button and fill in the name, the type and the size of the new field. Similarly, to edit the selected field, click the Edit button. To delete a field, select it in the list, then click the Delete button. You will need to confirm this action. To change the order of fields, select a field and move it up or down using the arrow button just to the right of the list. To adding fields from other dbf file, click the Import fields button. Finally, the Optimize button allows you to set each field length to its minimum possible value, determined by the maximum length of this field contents. For example, if among all records the longest value in the “Last name” field is “Schwarzenegger”, this field will be cut to 14 characters length.